Got an old or junk vehicle that you no longer require? This is a common problem for many folks. But don’t just leave that car to get all rusty on your driveway, lawn or garage. This will not be of any help to anyone, least of all you. It will make your property look messy, for one thing. And the space that the car takes up will be better used for other things. You will be most wisely advised to get rid of the car somehow. However, it is not a good idea to simply have the car dumped, as this is very bad for the environment. And you will be literally throwing money away. That car is really worth money, and there are people who will buy it! But who will pay the most for it? 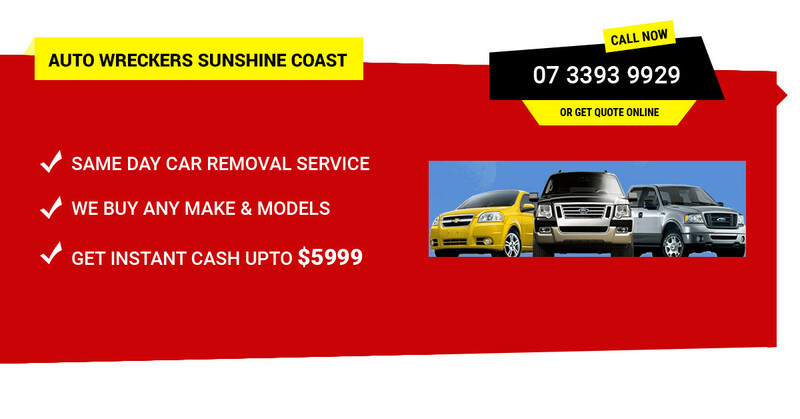 Our Auto Wreckers Sunshine Coast @ QLD Wreckers might just be the answer you’ve been searching for! Located in Sunshine Coast, Queensland, we have a knowledgeable auto wrecker’s team ready to support you with your automotive requirements. Not only is selling to us the most convenient and easiest way to sell a car. It isn’t just the fastest way to get the top cash for cars. You also stand to make some good money with Sunshine Jap car wreckers in Queensland. Get the maximum cash for your scrap vehicle with guarantee. We beat our competitors in a flash. Feel free to compare our estimations with other companies. If someone beats our price then we are ready to beat them back, only genuine requests will be considered though. There are other cash for car services out there who offer similar services to ours. However, you might find that they will require for you to actually get the car to their place of business before they make any final offers or pay you any money for it. If your vehicle is not in running order, this means that you will have to get in touch with a company that will charge you to tow the car. Commonly known as a towing company. Of course, you will have less money at the end of the day because you had to spend money to sell your car. Here at QLD Wreckers we don’t do this. We will come to your place and look at the car before paying you. Then we will use our own special equipment for car removal to remove your vehicle and transport it to our salvage yard. This ensures that you get one hundred percent of the money that the car earns you. If you are fixing your car, and have found that you need to replace a specific part, don’t buy it brand new. Did you know that used parts are just as good as brand new ones? And they don’t cost nearly as much. Very affordable indeed. You would be wiser to buy the replacement part from us here at QLD Wreckers. We have a huge range of used parts. This is because we are always salvaging them from all the cars that we buy. They are also all tested and refurbished, so they are in great condition. Don’t make any further hesitation. Call now at (07) 3393 9929 or 0416 615 100 for all used car parts inquiries in Sunshine Coast. There are toxic materials in all vehicles that come in the form of various substances such as fluids. This includes the anti-freeze, oil, along with the chemicals you find in batteries. Here at QLD Wreckers we made sure that these materials are not left to just leach out into the ground. They are either recycled or disposed of in the correct fashion. Along with that is the fact that when a car is recycled as opposed to simply dump, the steel that is recycled will be used again. This will lessen the demand for the raw materials that steel is made up of, which is mined. The mining process creates a lot of pollution and is bad for the planet. It also releases more carbon dioxide into the atmosphere, which is a major contributor to climate change. If you have a car that belongs to a line of models or whose manufacturer is one of the less popular manufacturers or models, normally this will make it harder to sell. However, the same isn’t true when you sell to us. We may pay you more, or pay you less, but there is no doubt that we will buy that car off you no matter what. Whether the car is a Mazda, Nissan, Skoda, Volkswagen, Toyota, Holden, Honda, Hyundai, Daihatsu, Isuzu, Mitsubishi, Suzuki, SsangYong, KIA, Daewoo, Ford, General Motors, Mercedes Benz, BMW, or any other model you can think of. The same goes for cars that are in bad condition, which if you are selling your junk car to us, this is guaranteed to be the case. We are not restricted to buying cars, our 4×4 Wreckers also buy vans, SUVs and trucks for the best price. You can get up to $15’000 for the Utes and trucks. Either give us a call or fill out the quote form on the website or we will get back to you ASAP. In case, our Auto Wreckers Sunshine Coast crew unable to pick your call, feel free to leave the message with your contact number and one of our friendly staff will get back to you within 24 hours. There is no charge of getting a quote so why not take the one and compare with others?